Tape University, a Shurtape entity, is dedicated to the ongoing education of all professionals that use tape as an essential resource or tool in their daily activities. Shurtape is a leading manufacturer and marketer of pressure-sensitive tapes in the United States and is now looking for three dedicated students to participate in Mission: HVAC 2019. This is the fifth year of Mission: HVAC, a scholarship program that was created to support and encourage HVAC students. As technology continues to evolve, an evident gap in skilled trades continues to grow. This is affecting many skilled trade industries, and one that is taking a major hit is HVAC . Per an article on Tape University’s website, there will be an estimated 31 million vacant skilled trades positions by 2020. The reason for this is that many Baby Boomers are retiring, and there are not enough members of the newer generations that are learning the necessary skills to fill the openings. There is also a barrier to entry for those interested in pursuing a career in HVAC, as the cost of a trade education can be high. Shurtape has recognized this and created Mission: HVAC to help pay for the cost of education for HVAC students. Mission: HVAC 2019 will be a 10-month program, during which students will be assigned HVAC-themed “missions.” These missions include researching the industry, interviewing industry professionals, and analyzing their own experiences in the field, among other things. The students will also have an exciting opportunity to publish their findings as blog posts on Tape University’s website. In the end, the students will receive $5,000 in scholarship money towards the costs of their HVAC education. 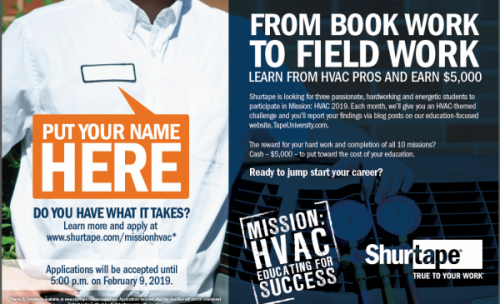 Shurtape is also looking for instructors from HVAC trade schools to join Mission: HVAC 2019. 2019 will be the first year of this segment of Mission: HVAC, and it will allow for educators to earn $5,000 to put towards the costs of necessary tools and equipment to help the HVAC students in their respective trade schools.